Out for Take-Away. One bat eats 1,000 mosquitoes per night. Exciting news…..The bats have found the boxes. 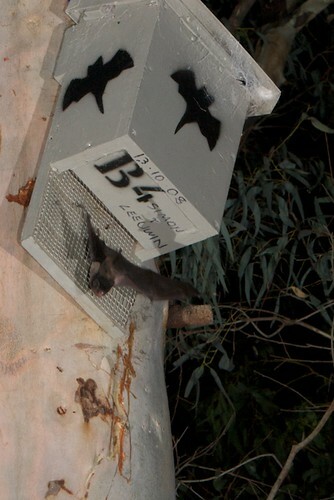 A community bat box building workshop which happened at Bibra Lake in October 2008 has been successful. This is simply fabulous news. Normally micro bats can take up to three years to find new homes but at Bibra Lake it has only taken less than two months. A recent inspection(Friday 9th January 2009) revealed two micro bats hanging off the rear wall of box number 8. Janene was the culprit who built this box and written on it was “Good luck little buddies”. Well, She gave it the midus touch because this is the first that the bats have found. This box is installed in about the middle of a cluster of thirteen. Attached to young trees which are only about 30 years old, the boxes are installed at about 6 metres high, they face approximately due North to maximise thermal exposure. The bats require tremendous heat to create nurseries. These micro bats can be observed from the ground by shining a torch up into the entrance. This will only light up the rear wall but it will give you some idea whether the bats are there or not. If you decide to do this please only keep the light on the bats for a short period. They can be disturbed too easily. A infra red video camera was set up beneath number 8 box to check how many bats were exiting. Good news , seven bats flew out in the space of about 12 minutes. Interesting enough some dived out of the box and didn’t switch on their echo location until well after they left the immediate area. The bats are taking up the boxes on a regular basis now. Two boxes had 28 bats in them. It took them a year but they found one of the sand-filled bat tubes. Another has been added just recently.At least six were in there making themselves comfortable. They also have started using the “Coffee stop” boxes. These are only short stay homes to roost in. Just like humans like to socialise and have a coffee somewhere that’s what the bats like. Not to have coffee of course….. While filming at night for more Youtube videos, a night predator flew up and landed close to one of the boxes. This was a Tawny Frogmouth. He tries to catch the bats. This is an important reason why bats always like to switch their roosts. Keeps the predators confused. Tawny Frogmouth waiting to pounce on the bats. This entry was posted in Uncategorized and tagged Recommended bat boxes, Successful bat boxes, Tawny Frogmouth. Bookmark the permalink.